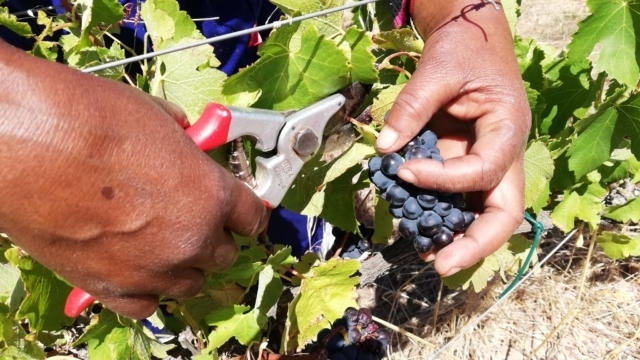 Botriver Wine Route > News > Luddite > It’s exciting to be a grape! I start off as a little flower and slowly get bigger in the shape of a little rugby ball. I’m green and hard and very sour. But as the days get longer and the sun gets hotter, I start tanning. But I don’t go red . . . I go a lovely dark purple. And just when I’m thinking I look plump and grand, I find out that birds want to eat me. So dodging the sharp beaks in the gentle breeze, I breathe a sigh of relief that I have survived only to hear the winemaker shout, “It is time to pick!” So just as I thought I was going to get really sweet, me and a bunch of my mates get pulled out of our comfort zone. But worse is still to come. We get tipped into a whirring machine which smacks us off our stalks and all of a sudden I find myself in a dark tank with thousands of plump berries like me. After a few days, it gets nice and warm and fizzy in this tank. And the longer we are there, the less sweet we become and a strange dizziness and ‘I don’t care attitude’ overcomes us. Then we get deeply depressed and just before we get too depressed, we realise that we are the privileged few that are going to be pressed into a bottle of fantastic Luddite Shiraz 2019.